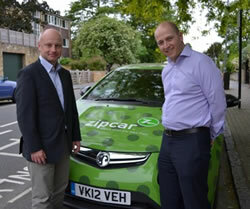 Zipcar chooses Putney as one of the test venues for its new range of electric vehicles. 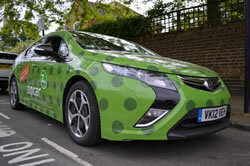 Ten Vauxhall Amperas are now being introduced across London as the car sharing scheme becomes the first in the UK to offer environmentally friendly electric vehicles to its members. As part of the six month pilot project Wandsworth Council has created a dedicated parking bay on St John’s Avenue, Putney, for the exclusive use of the electric car. The space comes with its own charging point so the battery can be topped-up in between uses. If the trial proves successful more electric models could come into services across the borough and beyond. To find the nearest car club vehicle near you enter your postcode on the Carplus website. “This could be the first step towards an even greener car club and we’re delighted to be involved with the trial. These eye-catching, low-emission cars could help us to cut traffic pollution and we hope will attract even more local people to sign up. “At Zipcar we are committed to positive change in our city environments. We believe that this pilot marks a step change in the evolution of electric vehicles in London and represents a major advance for London and Londoners. European Car of the Year for 2012, the Ampera is a full-performance and full-speed Extended-Range Electric Vehicle. It can travel free of exhaust emissions for up to 50 miles after which it shifts to a petrol generator that produces electricity to keep it going an additional 310* miles on a full tank of petrol. Because many trips taken by Zipcar members are less than 35 miles, it is anticipated that a large number of journeys will use electric power only. Even more car club vehicles are currently being introduced on Wandsworth streets as the council continues its efforts to expand the schemes. The roll-out means thousands more local residents now have a low cost, pay-as-you-go car sharing vehicle within a short walk of their home. Expanding car clubs is a key priority for the council's Travel Choices campaign which aims to give residents new and improved transport options. Other objectives include increasing capacity on rail routes, bringing the Barclays Cycle Hire Scheme to the borough and extending the Northern Line to Battersea. There are three car club operators in Wandsworth - Zipcar, City Car Club and Greenwheels. Each operator offers cars on a pay-as-you-go basis which can be picked up from a local bay used for as little as one hour at a time before being returned to the same spot. The cars can be booked on-line or over the phone.